Time and attention to the message you create with your clothig and appearance, verbal and non-verbal communication (including etiquette and body-language) are important . A few occasions include the first day of class, a blind date, a job interview, an appearance in court, or the day you have to present a report, make a sale, or participate on a committee. Occasions that demand a more authoritative appearance include job interviews and performance appraisals, first meeting with client, meeting with supervisor, meeting with board members, presentations, public/press/TV interviews, court appearances, and bank transactions. 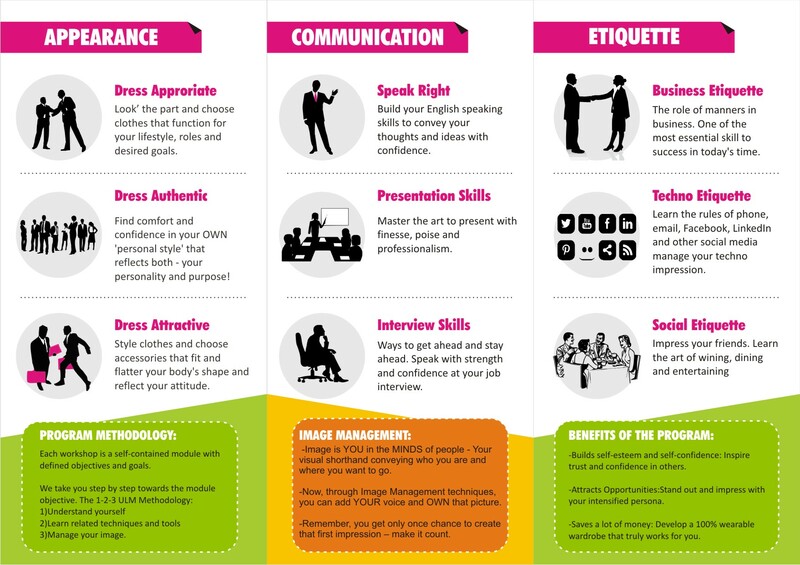 Image management ( Apperance, Communication and Etiquette) is one of the fastest and most effective ways to build self-esteem, to boost self-confidence, to reflect ability, and to increase credibility. NINE PROGRAMS , DESIGNED SPECIALLY FOR YOU ! Each program is spread across 5 sessions to enable improved and longer lasting learning.